Cost-Plus Pricing is probably the most prevalent method of determining price for small businesses. Cost-plus pricing means adding up what it costs to provide a service and adding some level of margin. In grocery, this usually means 15-25% margin on direct costs for the product, in high volume manufacturing this can mean 7% margin on costs to produce. In some other industries, we may see as high as 50% gross margin, but that rarely includes fully loaded overhead. The important part of cost-plus pricing is to ensure you fully understand your costs. In some cases margin is expected to cover overhead expenses, in other cases, you can estimate your overhead expenses as part of your costs. It’s important to be conscious of which one you choose to ensure you’re not losing money every time you sell a product. Part of the template estimates a version of your Fixed and Variable Expenses based on 12 months of history from your P&L. Cost-plus pricing doesn’t necessarily account for competition. If it costs your competition less to make a product than you, they might sell for less than it costs you to make the product and set the Market Based Price low enough that you’ll never be able to sell at the price needed to be profitable. Cost Plus Pricing adds up all of the costs associated with producing a salable product and adds a gross margin to those costs to set a price. The important part of this method is to appropriately understand your costs so that you account for them in your cost estimate. We’ll be amortizing development, capital, and indirect sales expenses. We’ll also be looking into variable overhead expenses and allocation of fixed overhead. With appropriate cost estimates, it is possible to understand where your price should be to be profitable. Orange cells indicate a field that you should be entering data into. In some cases, I have included calculators to make getting the values easier. If there is a formula in a cell then you may not need to override the value, but rather fill in the calculator worksheet. The main point of this exercise is to think through expenses associated with a product to help ensure we truly understand what it costs to provide a service. As mentioned, in some cases you may make a conscious choice to have your gross margin cover a specific overhead expense such as rent. In that case, it is still worth doing this analysis but understand that your stated Gross Margin is not truly the profit you’ll make per unit sold. This is a very basic template and may not be comprehensive in which cost categories are included. We’ll go through the included categories one by one. Direct expenses include what it costs in materials and labor to produce one unit of product. This is probably the most straightforward to understand, although it is usually an estimate and I recommend you do some Sensitivity Analysis on these costs at some point. Amortized Expenses should include all of the investment you have to do in order to develop, produce and sell the product. We distribute those costs evenly across the total expected sales volume. It is a very good idea to avoid using more than 3 years of sales volume to allocate these expenses. It is also a good idea to be very careful about what expenses and volumes you use here, as I’ve seen over and over again that expenses at least double and volumes decrease by at least half from the most pessimistic predictions. Variable expenses are all of the overhead items which increase as a result of increased sales. These are all of the consequentials of doing more business such as office space, postage, and administrative labor. I could write an entire post on understanding Variable Expenses. 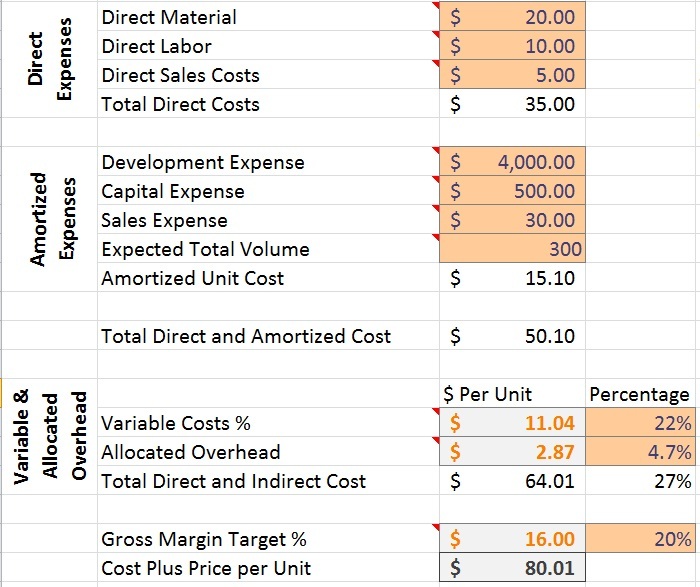 One key difference in this template is that since we’ve already included your direct costs for the product, we’re going to calculate Variable Costs based on gross profit instead of sales as you would in most other cases. This is to avoid double counting. Use the Variable Cost Calculator worksheet to enter data from your P&L. In order to avoid double counting your amortized expenses in your variable overhead, we need to specifically exclude those expenses from your P&L. So enter your overhead accounts for development and sales expenses which will be counted on the amortized expenses portion of the main sheet. Fixed overhead is the portion of your expenses which is constant in spite of changes to gross profit. You can decide to amortize this over the portfolio of products or choose to increase your Gross Margin to account for it. I would recommend you at least understand how your fixed overhead gets allocated across all of your products to ensure it is being covered. If this were a business case using Marginal Analysis we wouldn’t include fixed overhead, but that’s a different situation and a different blog topic. The Overhead Allocation Calculator attempts to help you allocate an appropriate portion of overhead to this product. The calculator assumes that the product we’re assessing is an average size product for your business, which allows us to divide the overhead by the number of products. 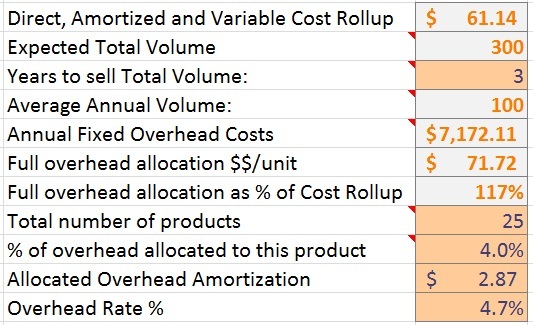 If this product’s sales will be disproportionate to the average product in your portfolio, then override the “% of overhead allocated to this product” cell to reflect a more appropriate value. The Gross Margin is the final part of this. If you’ve completely allocated your costs and overhead, then this should be equal to the owners expected take-home profit as a percentage of sales. We use Gross Margin instead of Profit Margin because it reflects the percentage of sales instead of the percentage of cost (where all other costs have been a percentage of cost). Gross Margin will be more akin to the number which an owner would calculate based on the P&L and have as a high-level target for the company.